We live on an eccentric planet, thanks to the number twenty three and a half. That’s the axial tilt of our dear old planet, and the reason for the seasons. Which in turn is a grounds for both rejoicing and lament. Here in the higher latitudes of the southern hemisphere, April brings a noticeable attenuation of days, a lessening of sunlight, a return of colder weather and frost. Slowly the plump warm air that has coddled us for half a year is receding, and the sun’s strength is gradually diminishing. Everywhere we respond to this with a mixture of alarm and alacrity. No sooner are we relieved that wild fires are over, than we start gathering in our firewood. We start warming our houses, burning the dust off our heaters. We wash our woollens and put them to everyday use. Our vegetable harvest gradually slows, and salads make way for soups. In the wider world the signs are there too. With this week’s first dusting of snow, currawongs and cockatoos congregate in our forest, suddenly more earnest in their search for food. 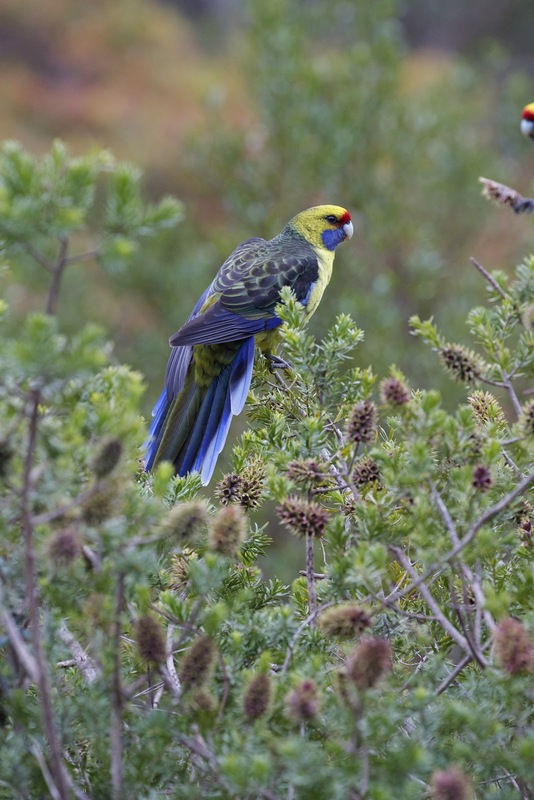 Beside our house a flock of green rosellas (Platycercus caledonicus) lands on a kunzea bush. Without a sound – not even their soft, bell-like contact call – they work away at the seed heads. They are normally shy, but they are so intent on eating that I can study them carefully without disturbing them. Their markings are subtly spectacular, from a fluoro lime-yellow head and chest, to a striking crimson frontal band; from a back that's an olive-blue plaid to a tail that's a rhapsody in blue-green. 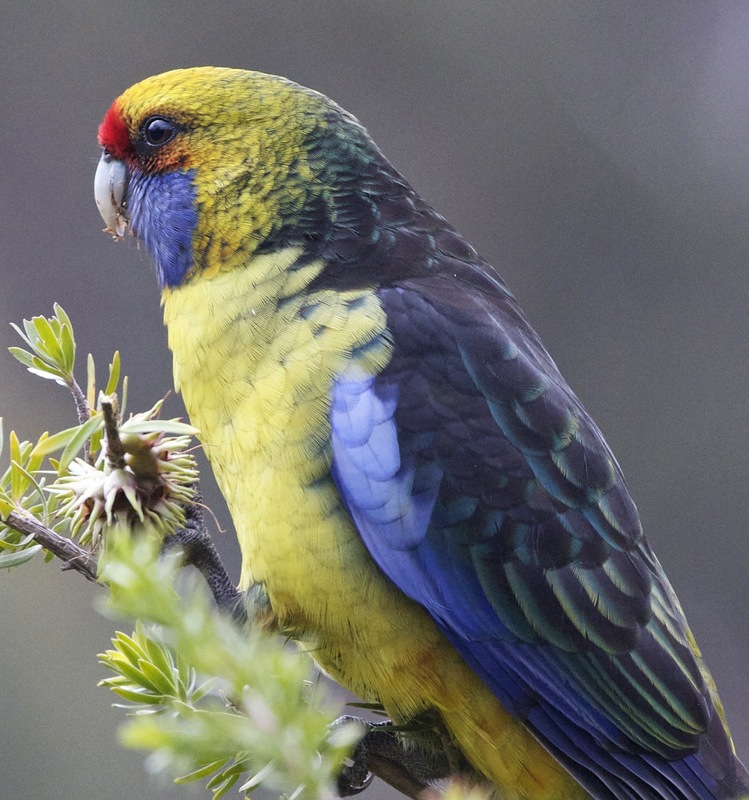 I have observed our resident rosellas often over the decades, once peering through binoculars as several of them de-berried a cotoneaster bush. At first I thought them sloppy, as they discarded great gobs of berry pulp beneath the bush, like gormless diners talking with their mouths full. Slowly it dawned that the pulp was of no interest to them. By rolling the berries between their tongue and beak, they were able to break up the fruit, discard the pulp and ingest the seeds. I later learned that cotoneaster berries contain cyanogenic glycosides, which are toxic. Doubtless the rosellas had learned this long before me. Our native plants, with the spectacular exception of Tasmania's deciduous beech (see link), don’t respond to autumn via leaf colouration and deciduousness. But this doesn’t mean they don’t respond to the shortening of the days, and the drop in temperature and light levels. 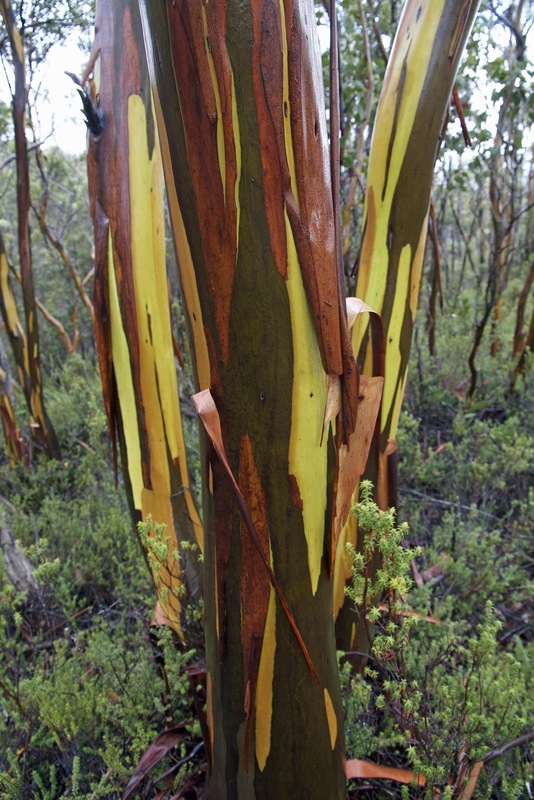 Particularly in colder areas, a number of our eucalypts undergo their own response to lowering photosynthesis, resulting in brilliant colouration of their peeling and fresh bark. On recent alpine walks I have come across yellow alpine gums (Eucalyptus subcrenulata), snow gums (E. coccifera) and yellow gums (E. johnstonii), all putting on brilliant bark colours in the face of cold, wet weather. 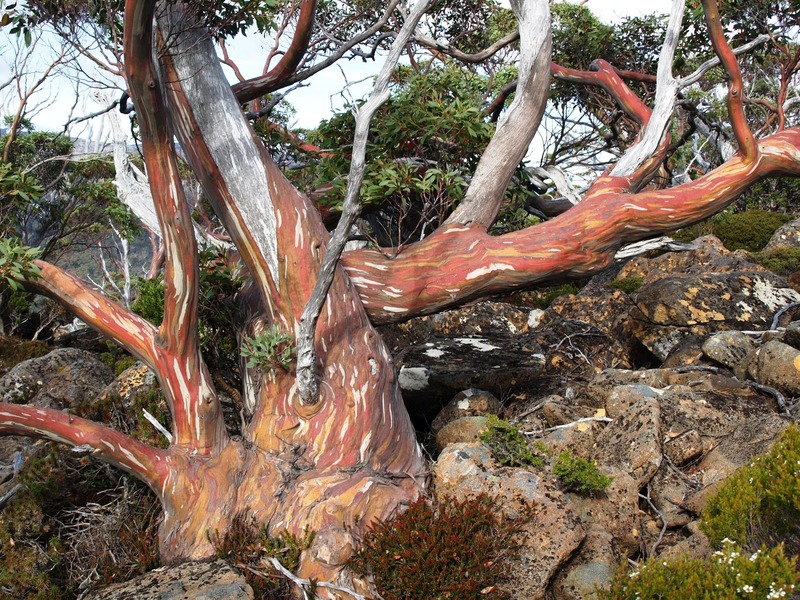 It appears that the withdrawal of chlorophyll allows the pigment anthocyanin to exert a stronger influence over the bark, colouring some of it red or orange – just as it does in deciduous leaves. As this older bark peels it contrasts strongly with the paler new bark that is revealed beneath. The process varies from species to species, even from tree to tree. But in the end it’s all in response to that amazing 23.5 degree tilt. Also enjoyed those wonderful tree colours, to say nothing of those subtle and witty rosellas. Years ago, two of them spent all day >inside< a trimmed Cotoneaster in our garden (long since eradicated! ), reaching out periodically with a claw and drawing in yet another bunch of berries. Love 'em. Perhaps this post was inspired by the really rather good show "Orbit" that has just completed on ABC1? Thanks for your comments Greg and Alastair. I did watch "Orbit", and thoroughly enjoyed it. I've long been in awe of our tiltedness, and the endless fascination it brings to life on Earth. As I watched their explanation of seasons - and the tilt of the planet - I was calling out "23.5 degrees! ", and getting quizzical looks from Lynne!